Social media has become a great platform for entertainment as well as for interaction; it is indeed the best way for fans to interact with their favorite celebrities. Not only fans, but even celebs use this platform to interact with each other. Birthday wishes are something that you often see on Twitter; some are very exciting, while some are way too funny. Recently, we saw Boman Irani and Farah Khan interacting with each other on Twitter on Boman Irani’s birthday. 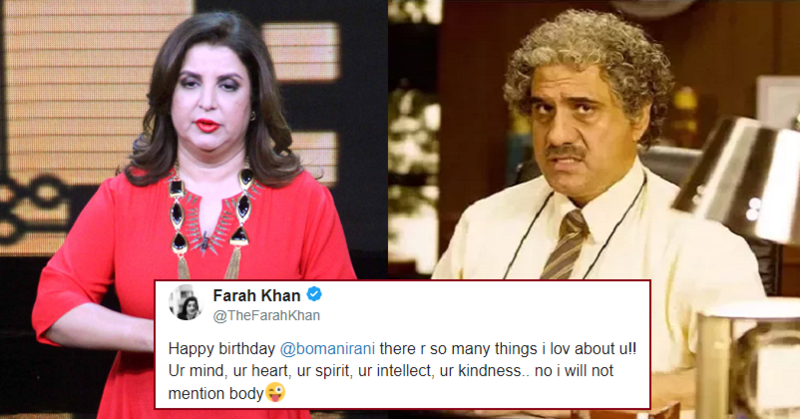 Well, they share a great rapport & so, Farah took to Twitter to wish Boman a very happy birthday. However, her way was very punny & it immediately caught attention of Boman. Both of them worked in some interesting films like Happy New Year, Main Hoon Na and Shirin Farhad Ki Toh Nikal Padi; their chemistry could be seen in the exchange of tweets. Haha, we loved this camaraderie, what about you?